I have been reading through old copies of the Railway Magazine from 1951. The 600th Edition of the Magazine was published in April 1951. 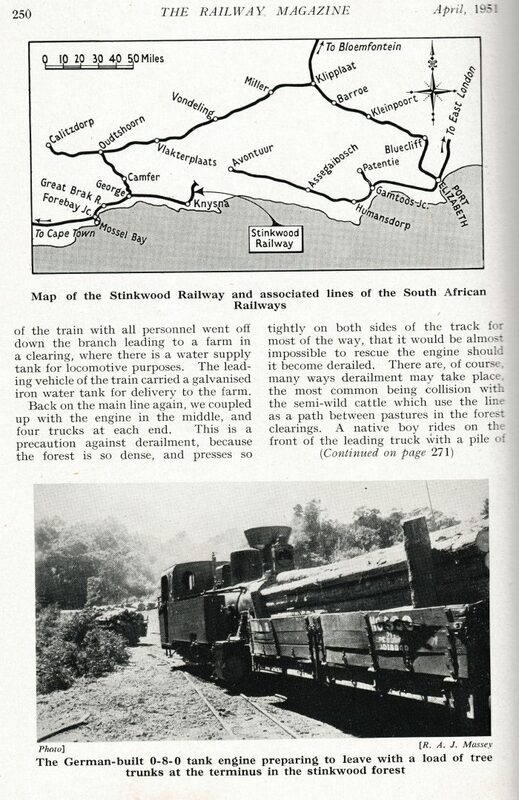 A fascinating 2ft narrow gauge railway in South Africa is covered by a short article in the magazine and I have been doing a little research into the line. 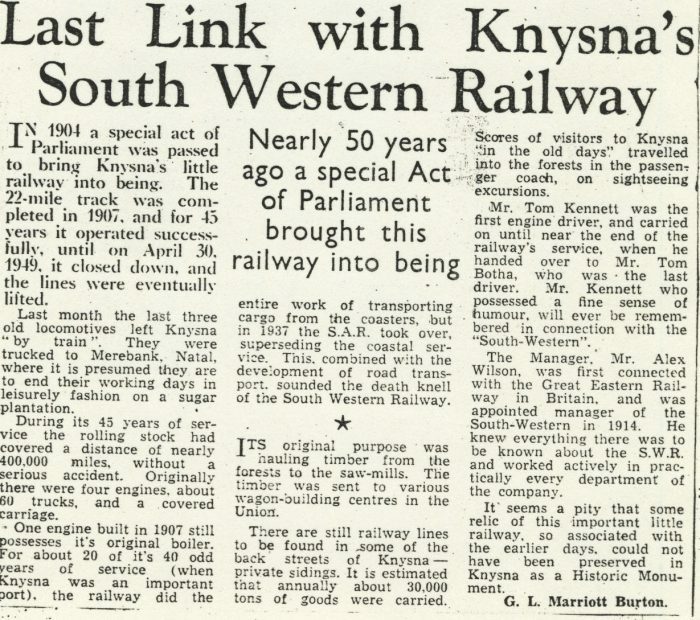 First a copy of the article which is legible in its scanned form and does not need repeating  The line ran into the forest from the town of Knysna on the South Coast in the area known today as ‘The Garden Route’. 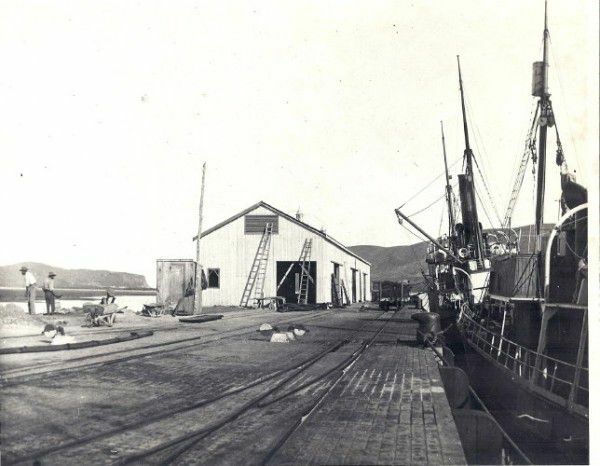 It was used to bring felled Stinkwood timber to the port at Knysna. 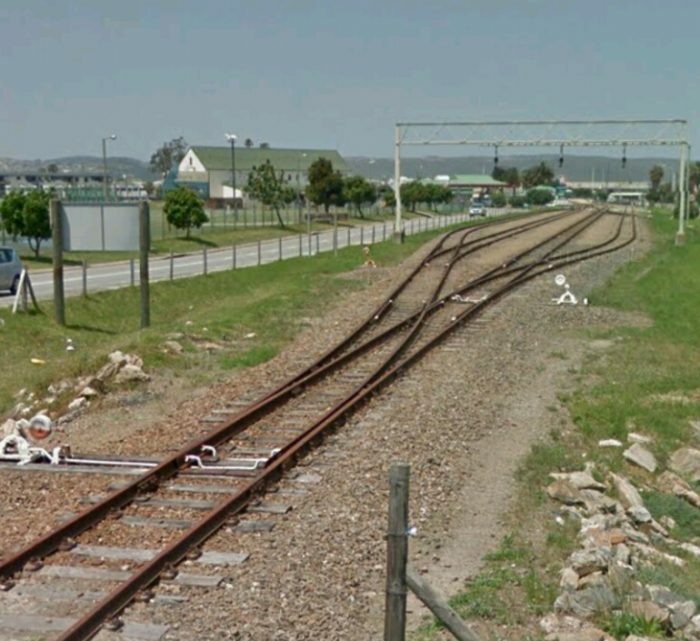 The line between George and Knysna was until 2009 the last remaining steam hauled mainline service in South Africa. 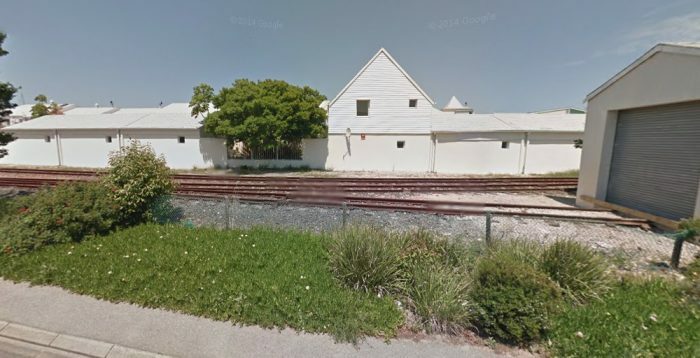 There are renewed hopes that the service will open again provided major repairs are completed on the route. That line is shown schematically by the line of grey diamonds on the pictorial map above. 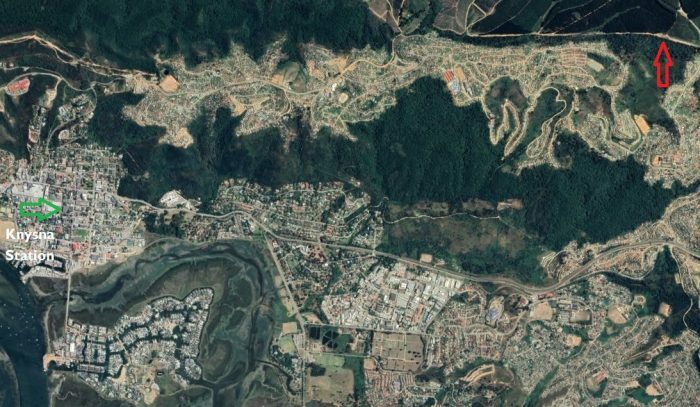 And can be seen on the Google Earth Satellite image below. 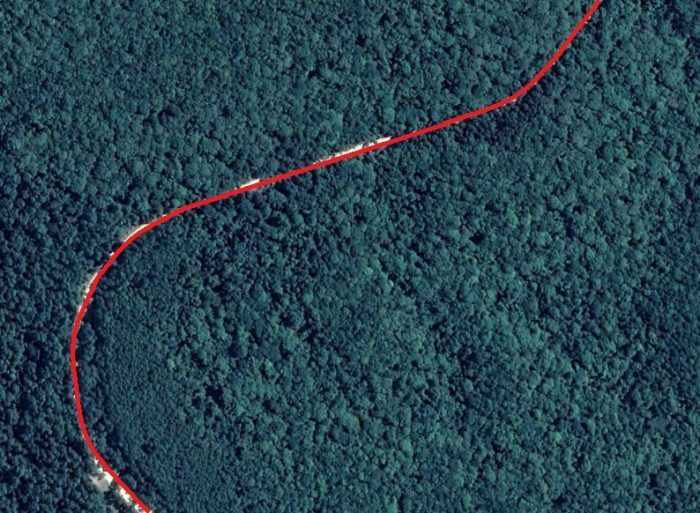 This line was built some 20 years after the 2ft-gauge line into the forest. The railway from George approaches Knysna across the river estuary. 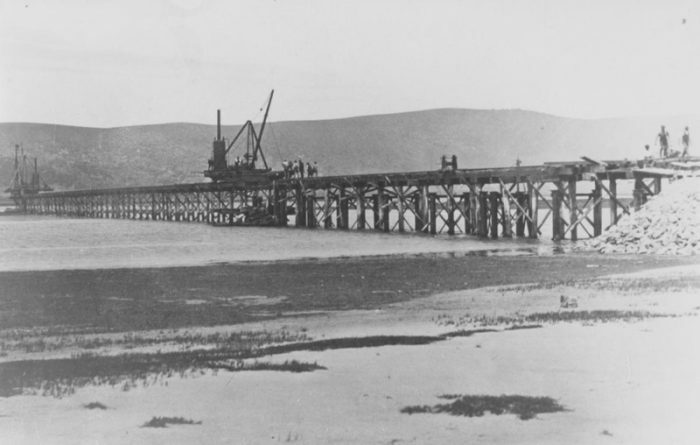 The construction of the estuary bridge in the late 1920s. 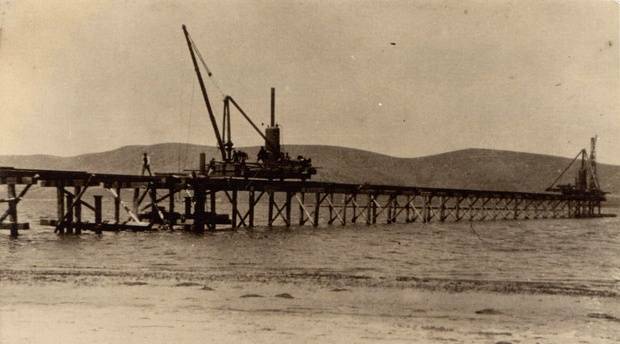 The construction of the estuary bridge in the late 1920s. Looking West along the river bank towards the estuary bridge. 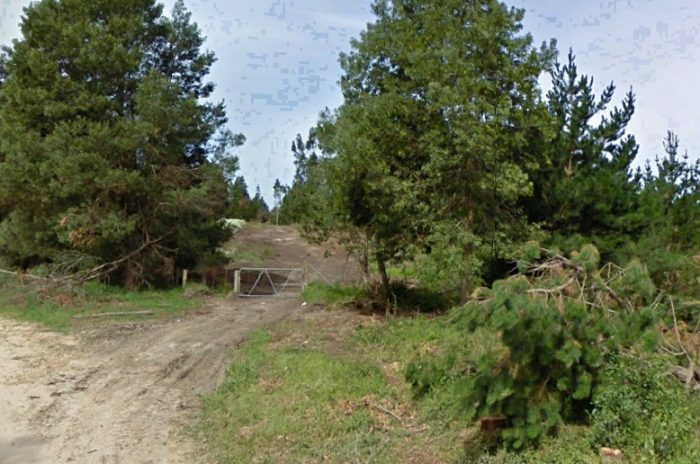 The image comes from Google Street view. 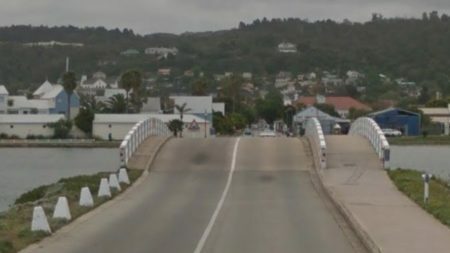 Looking East towards the terminus in Knysna. The station approach. The station buildings. The station site viewed across the turntable from Waterfront Drive. Another view from Waterfront Drive which shows the station buildings and watertank. The line to the East of the railway station. The picture is taken on Gray Street looking East. Further East looking South across the lines from Waterfront Drive. Even further East, this time looking East from Waterfront Drive. Looking back to the West from Long Street. Looking East from the same point on Long Street. 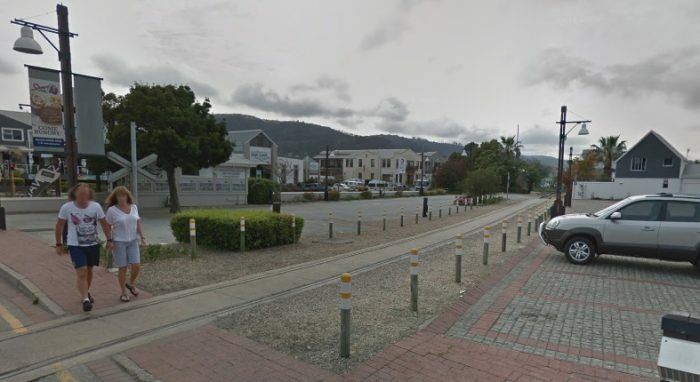 Long Street is the extension of the causeway from Thesen Island into Knysna and was the route of the old 2ft gauge line from Thesen Wharf to Knysna Station. 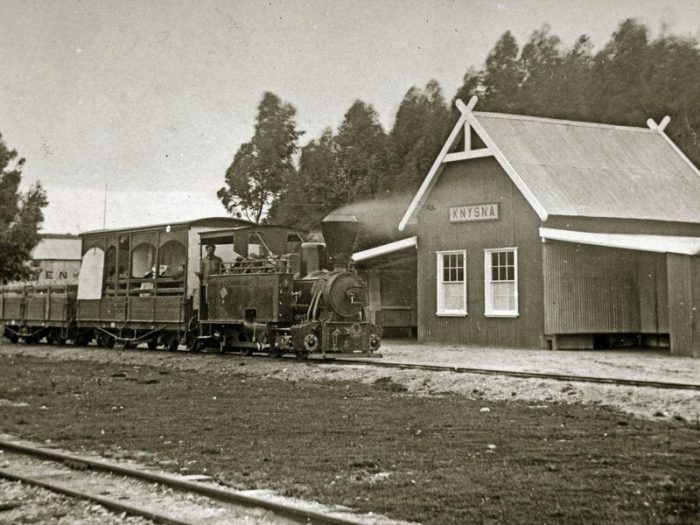 The Stinkwood Railway, as the line is named in the Railway Magazine article above, was affectionately known locally as the Knysna ‘Coffee Pot’. It was owned and operated by the South Western Railway Co. Ltd and built over a period of three years from 1904 to 1907. 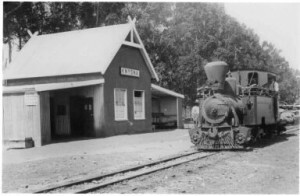 It ran from the pier-head in Knysna to Diepwalle in the forest and served for 42 years until its final closure on 30th April 1949. 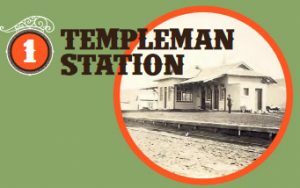 The story of the line as recorded locally is quite different from that in the introduction to the Railway Magazine article which suggests that the line was built around 1920 or thereabouts. One wonders whether R.A. Butler was misled. 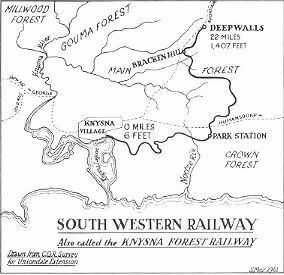 The Cape Colonial Government promulgated an act: the South Western Railway Co. Ltd. Act. (Act No. 16 of 1904), which provided a subsidy of £800 per mile for the construction, and stipulated various conditions. 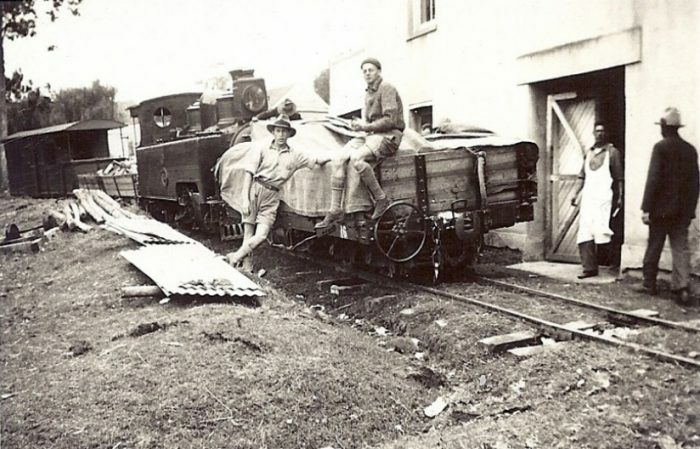 These included the gauge (2 feet or 600 millimetres), and that the quality of the construction materials had to be equal to that of the Government’s own narrow gauge lines. . The 2ft. 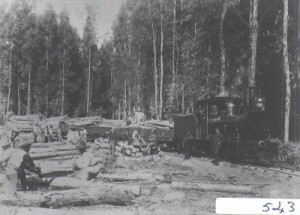 narrow gauge railway line transported timber (mostly Stinkwood  and Yellowwood ) from Diepwalle to Knysna for milling and shipment. 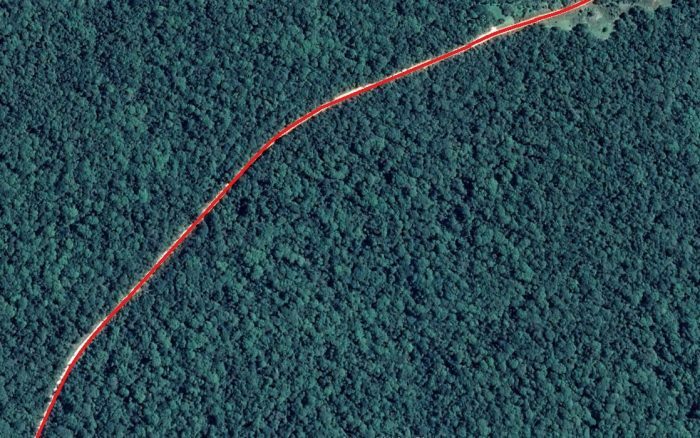 It ran three times a week 22 miles (31 kilometres) into the forest, to Diepwalle and back. Spark arrestors were fitted on the engine to prevent forest fires and gave the engines their “coffee pot” look. They were fat, bulbous fittings over their funnels, hence the name. There were 33 trucks designed to carry up to 70 tons of logs. 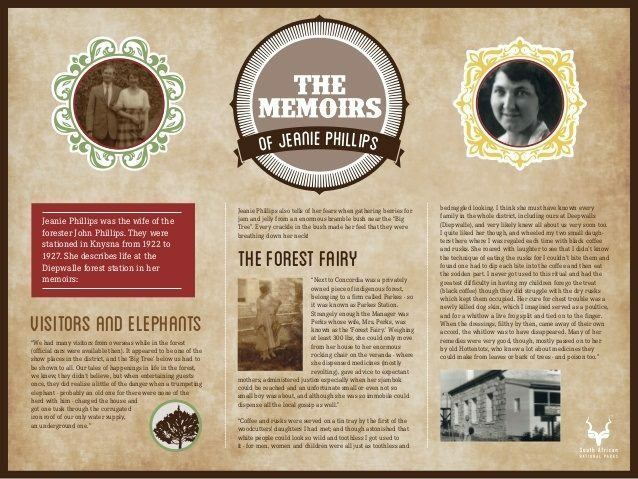 The following comments in italics together with the pictures included within the text are taken from notes researched and compiled by Mrs Margaret Parkes & Mrs. V.R. Williams on “South Western Railway Co. Ltd.” on the website http://www.webring.org. 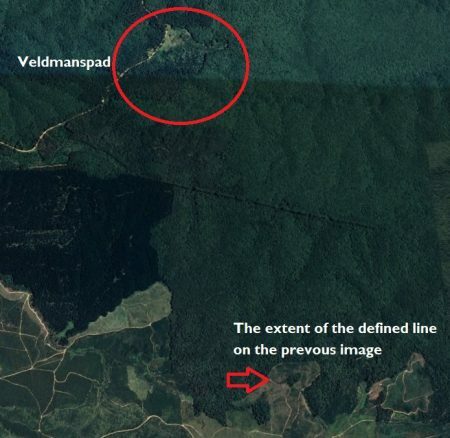 The smaller photographs alongside the text in italics are courtesy of Millwood House Museum, Knysna, SANParks, Department of Forestry. By 1911, the running costs of the railway were a constant worry to the Directors of the Company. 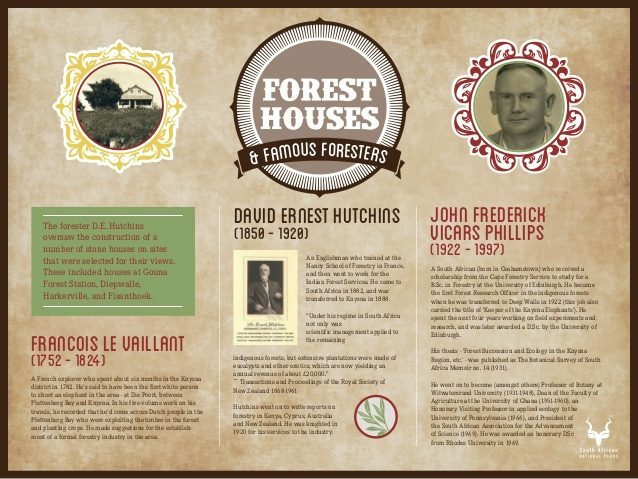 There was a general depression in the timber industry, and the distance and costs of transport inhibited local prosperity. But there was a sudden wave of optimism with the discovery of deposits of lignite. 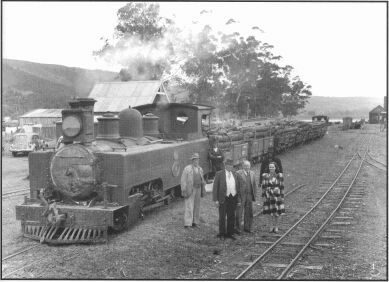 The Knysna Lignite Syndicate was formed and hoped to be able to supply locally mined “brown coal” to fire the boilers of the ‘Coffee Pot’ engines. Hopes were high, but sadly, the quantity or quality was inadequate, and by mid-1911 the whole venture fell away. 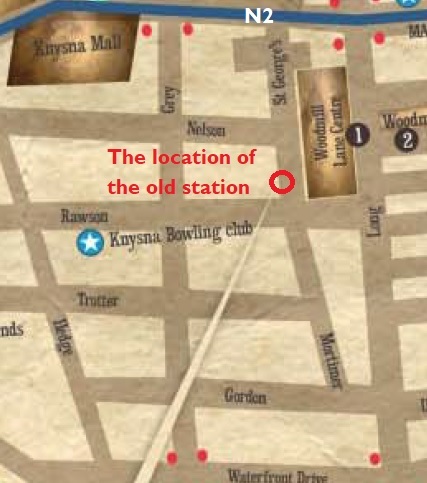 In May 1916, Knysna was flooded after torrential rains. 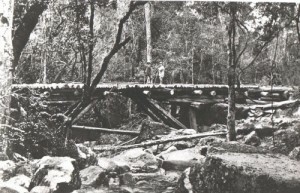 The flood not only washed away the brand-new concrete bridge over the Knysna river but also some of the railway bridges in the forest. In some places, tons of earth were washed away. 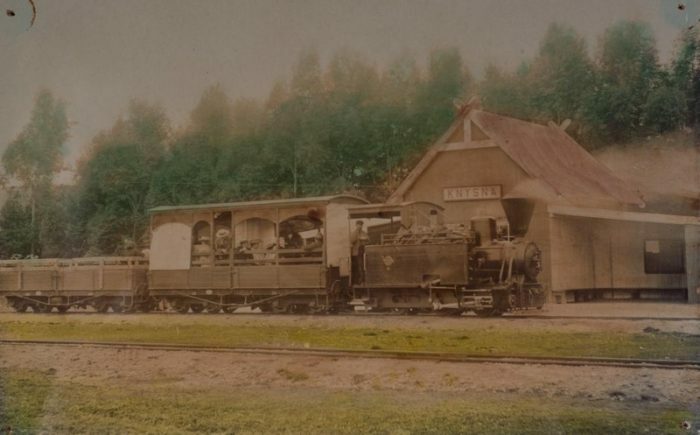 Filling and repairs were started immediately and a mere month later, when the first train was again able to run to Diepwalle, approximately 16,368 tons of material had been excavated and deposited to replace what had been washed away. 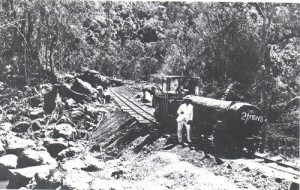 The railway had to be put out of action during repairs which meant a further loss of revenue. It was a bad year for the Company with World War I and the loss of trade due to the reduction in the number of visiting ships at the port. Meanwhile maintenance and general repairs had to continue to keep the railway line in good order. At last, in 1919, the Company made a profit! 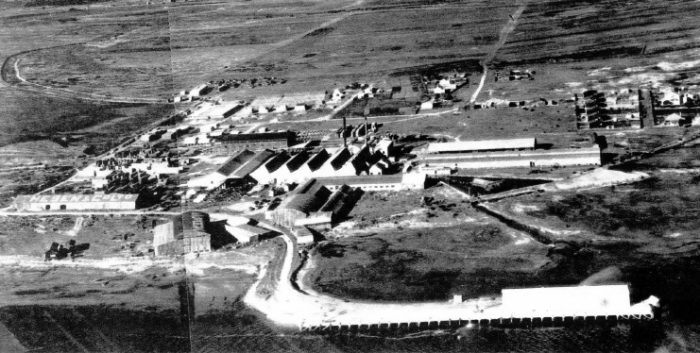 But unfortunately, in that same year the Government moved the sleeper factory from Knysna to Mossel Bay. 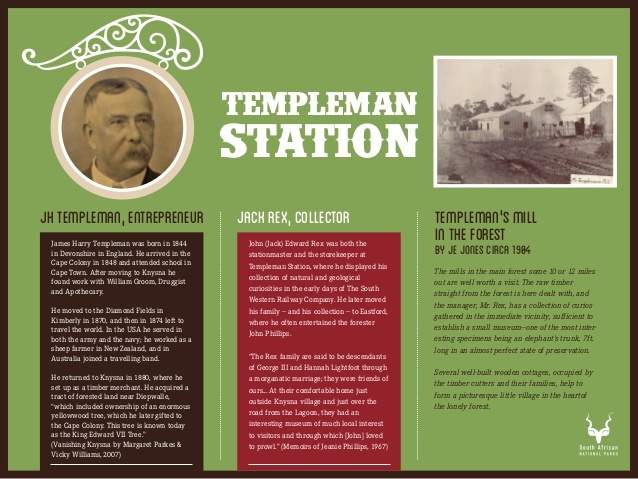 This was a real blow as the railway would be used even less, with many a repercussion to the fragile economy of the town. Throughout the 1920s’ and 30s’ maintenance costs and taxation took their toll and soon another engine had to be bought. The S.A.R. provided a 2nd-hand engine no longer required on the Umzinto line. The engine was in good condition and gave many years of service. But in 1927 perhaps the most serious blow which fell was when the S.A.R. finally connected Knysna with George by the standard 3 ft.6 ins. 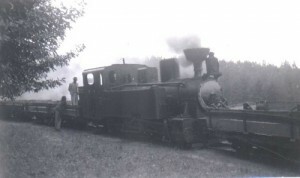 gauge line and any hopes that they would eventually take over the forest railway were dashed as all narrow gauge lines were considered to be obsolete. 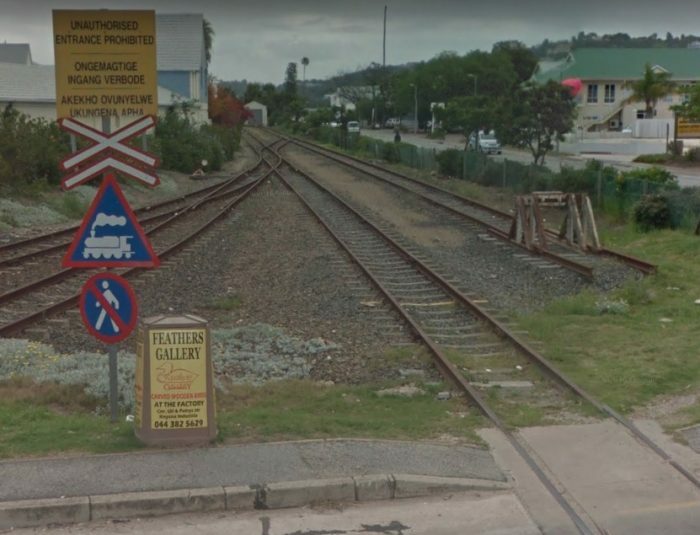 Revenues from the wharf had also decreased dramatically as it became so much cheaper to bring goods to Knysna by train than by sea and shipping activities at the wharf died down with fewer ships coming into port. Financial concerns over the company had still not abated.In 1944 a Committee from the S.A.R. 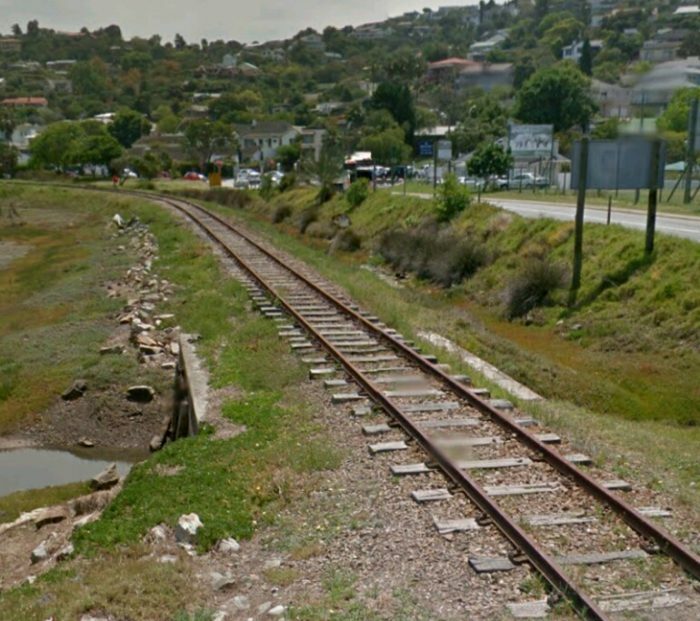 & H. came to Knysna to examine and report on the state of the “Coffee Pot” railway with a view to closing it down. 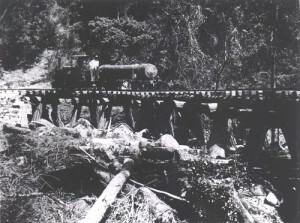 Corrosion was very bad on the line and “broken rails” were likely to become a major problem, and it had already been stated the line would carry no more passengers. Although the S.A.R. & H. recommended closing down the railway due to the deterioration of the line, they were forced to keep it going at least temporarily, because of the shortage of motor transport caused by World War II. It was then decided to have the line re-conditioned with old rails from South West Africa. In 1946 the re-laying of the track was completed with the second-hand rails and pronounced good for another 20 years. It was a difficult task and took over a year to complete. A modest tribute remains however, in the foot or two of rail set in the pavement on the right hand side of Long Street diagonally opposite Thesen House. But safer rails were not the answer to the problems of the railway. After the end of the war it was used less and less, as it became uneconomical to rail timber and the forestries, merchants and ship owners used private lorries instead. This meant another drop in the Company’s earnings. the only one of this type remaining on the continent (Parkes , p132). 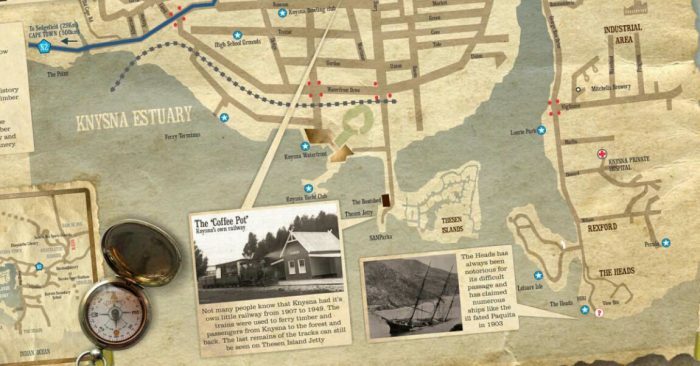 As we have seen above, the 2ft- gauge line commenced at the wharf and served Thesen’s plant on Thesen Island before crossing the causeway to the mainland. 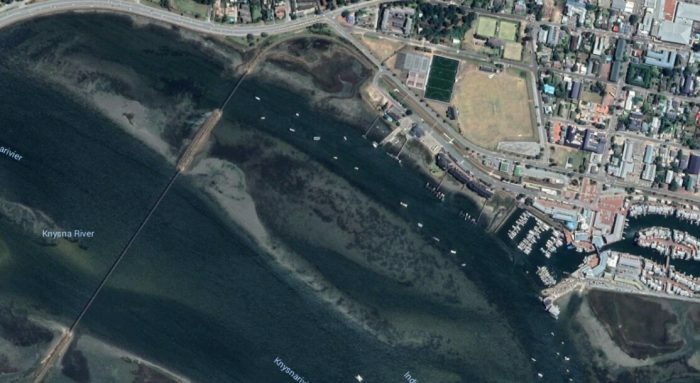 The adjacent Google Earth satellite image shows the remaining tracks in the wharf road surface. These have been retained into the 21st century as evidence of the existence of the old railway. 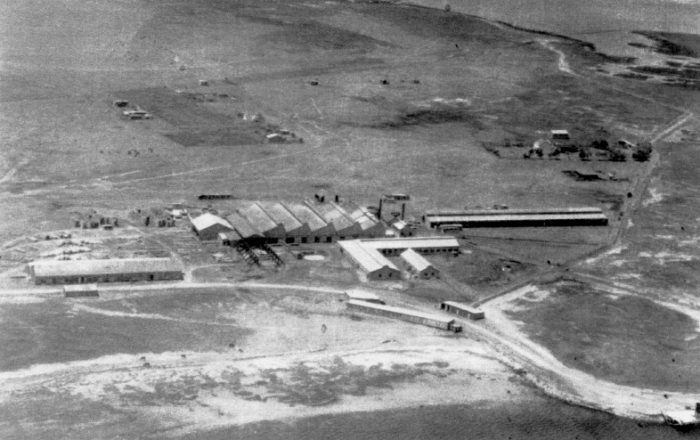 The Boat-shed visible in the monchrome photo above shows up clearly on this satellite image, right of centre at the top of the picture. 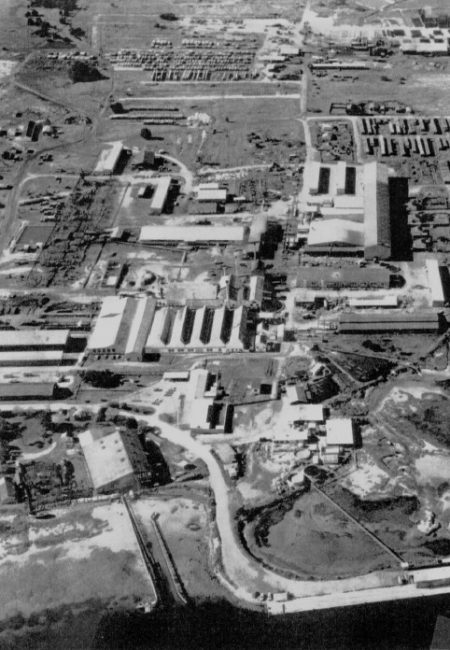 In the early 1980s Barlows, one of South Africa’s industrial conglomerates, purchased Thesen Island and its timber treatment plant from Thesen and Company. 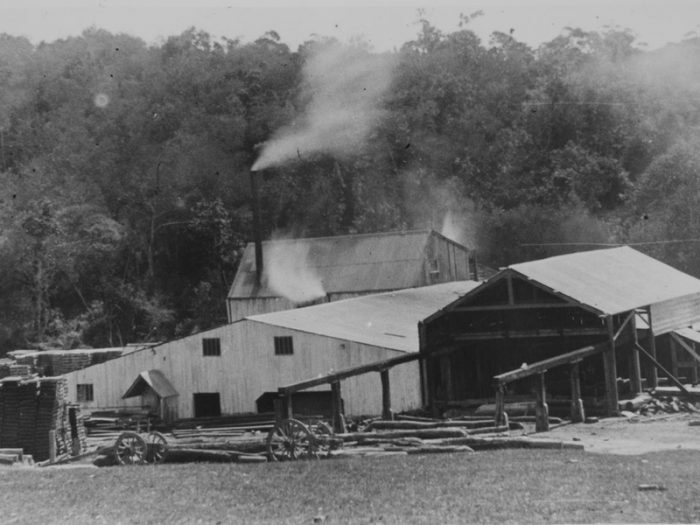 Barlows soon realized that the timber processing activities could not be continued on this island located in the midst of such a scenic and eco-sensitive lagoon. At the same time there was growing community concern about the environmental and industrial pollution caused by the factory’s activities. As a result the plant’s doors were finally closed. In the ensuing years the abandoned derelict buildings, machinery and waste dumps increasingly turned into an eyesore and a health hazard. 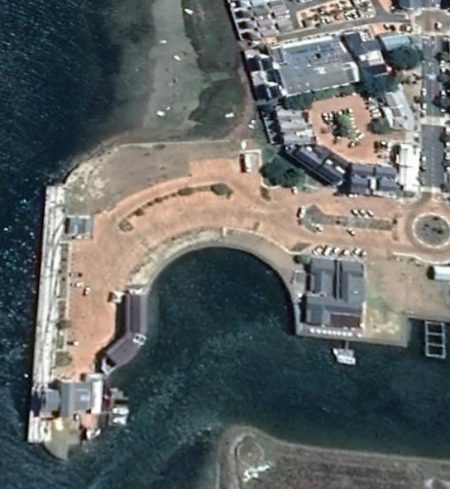 The causeway north from Thesen Island to the mainland appears in the adjacent Google Maps excerpt. At the half-point along its length there is, today a raised section (shown below) which allows access by boats and which also allows for tidal flows. 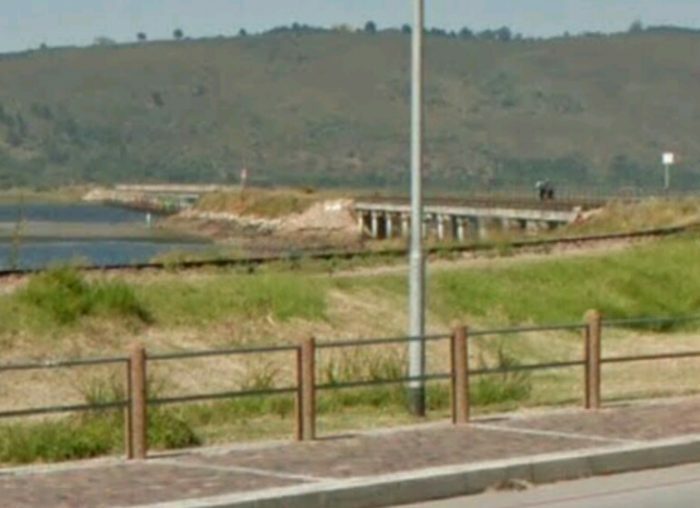 There was a bridge at this location in the past, but at the time of the railway the causeway level was maintained across the structure. 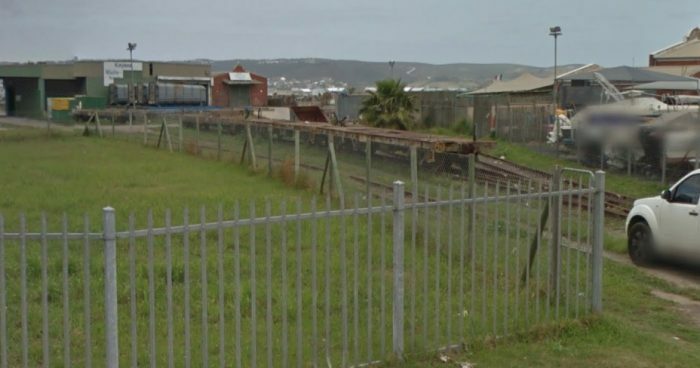 The old trains used to trundle along what is now Long Street north of the causeway and crossed Waterfront Drive before drifting away to follow the line of Mortimer Street and St. George’s Street to reach the location of the old Knysna Station. It appears that the station was located close to the timber merchants visible in the picture taken from Mortimer Street looking towards St. George’s Street below. The image above is a Google Streetview picture taken from Mortimer Street looking North. 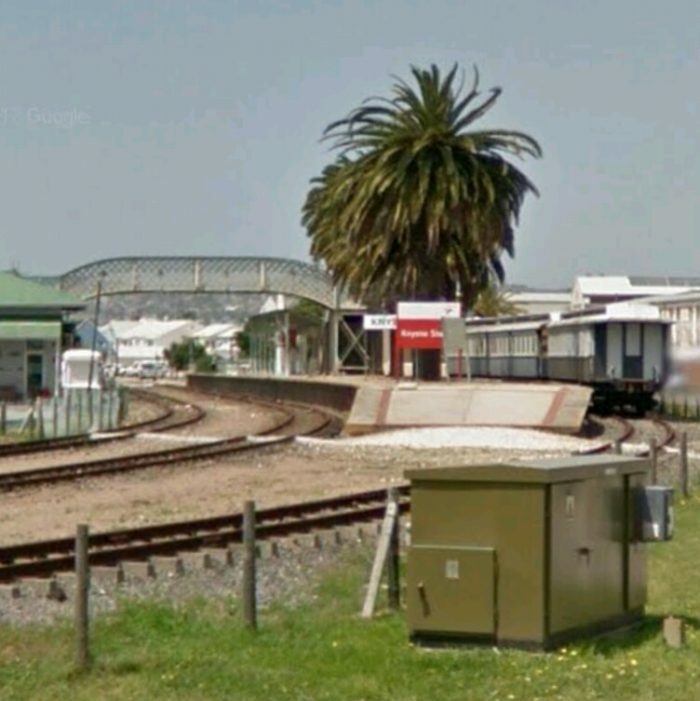 The next few pictures show the Knysna Railway Station which was a corrugated iron structure on relatively open ground on what was then the north side of the town of Knysna. The adjacent satellite image takes the extrapolation as far Northeast as it will go without being in any way forced. 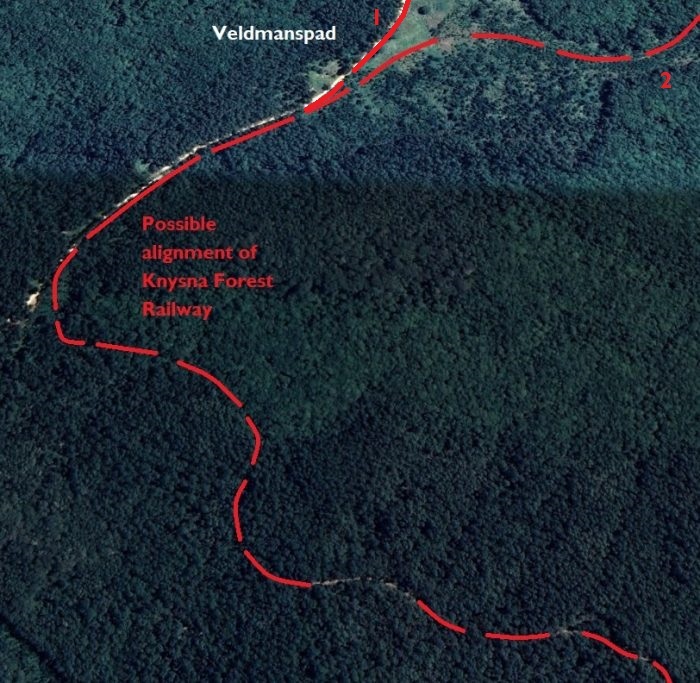 I have been unable to establish beyond doubt the route of the line travelling on to Diepwalle. 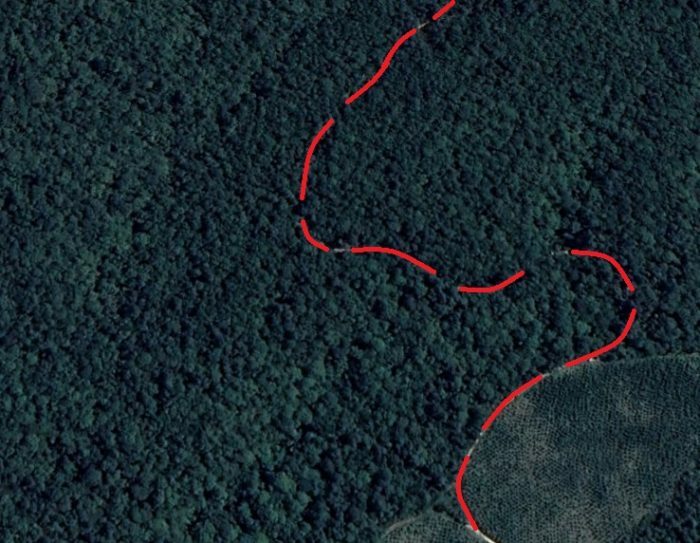 It seems to me that the most likely route is one which follows the road through the forest. 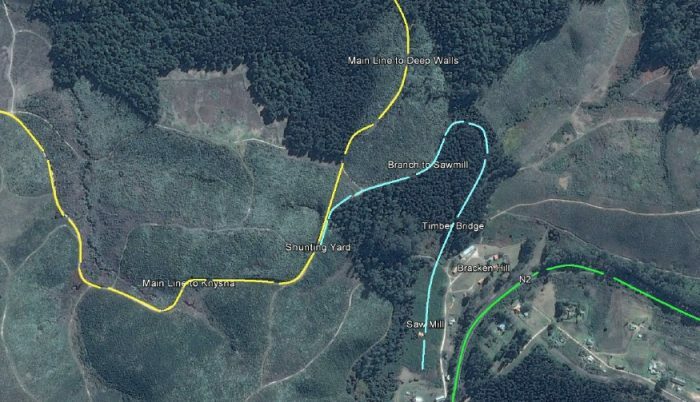 I hope to continue research on this line to confirm the route taken between Brackenhill and Diepwalle. 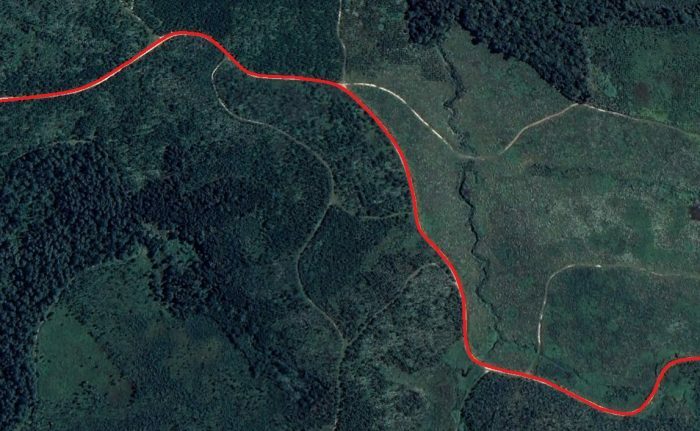 Please, therefore treat the notes about the remaining length of the route with a degree of caution. ….. 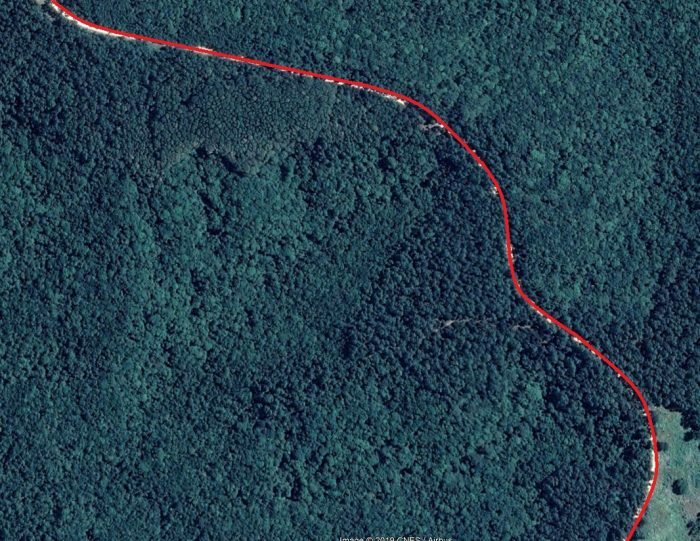 Given the layout of the land, it seems highly likely that the old railway followed the shoulder of the modern gravel road as shown on the adjacent satellite image. Towards the top of the image there a road junction. 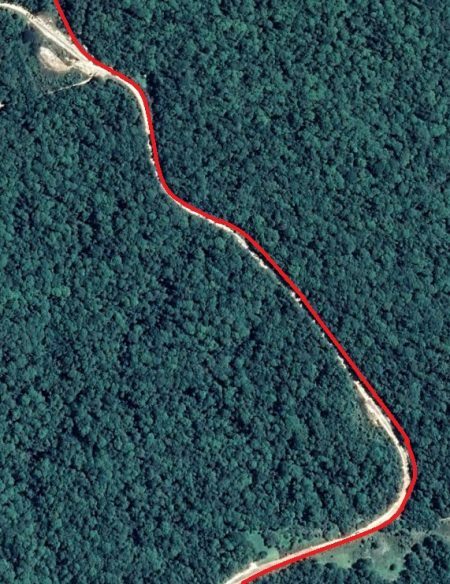 Turning left leads the explorer to the site of a large and old indigenous tree, the “Big Tree.” Heading straight-on keeps to the main gravel road. Bearing right takes on along what appears to be the old track-bed of the railway into Diepwalle. The Google Streetview picture below shows the junction. 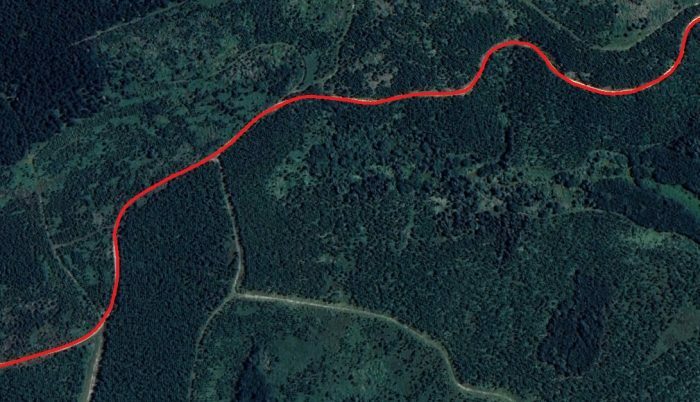 The route from here travelled approximately northwards and the curved a little towards the East as it entered Diepwalle. 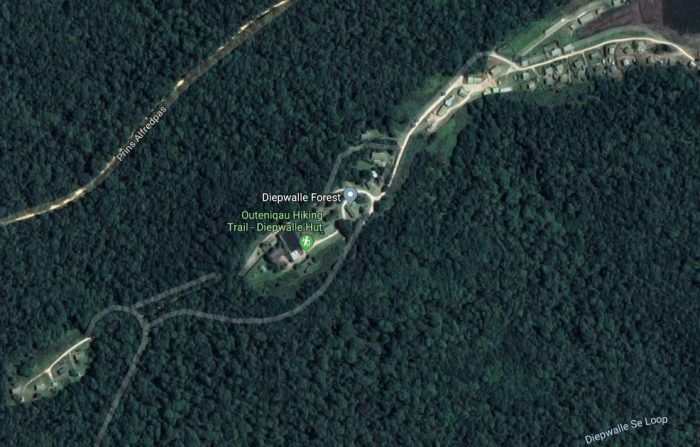 The satellite image below shows the whole Diepwalle site. The railway terminated here. 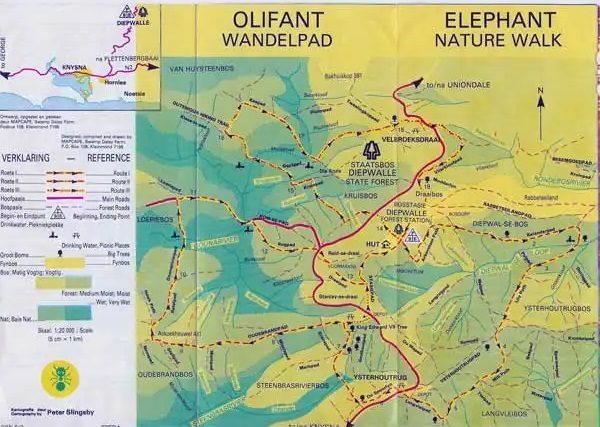 Sadly, I have so far been unable to determine the layout of the railway at Diepwalle. 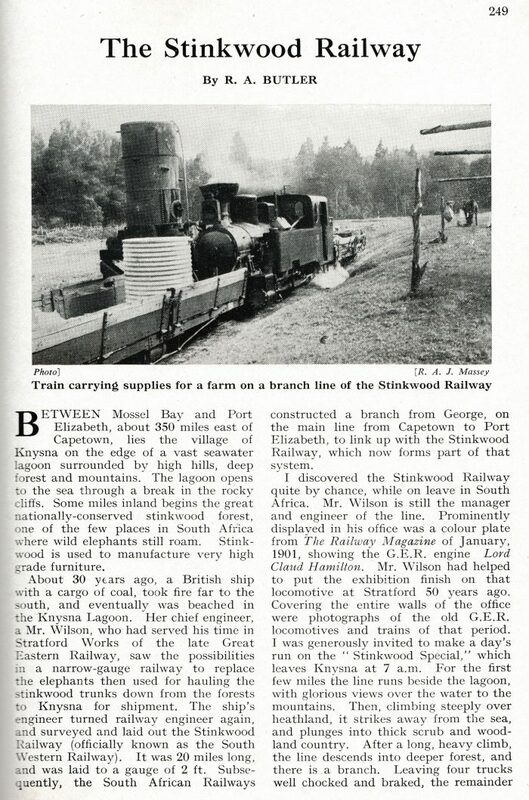 R.A. Butler; The Stinkwood railway; The Railway Magazine No. 600, April 1951, p249-250, p271. 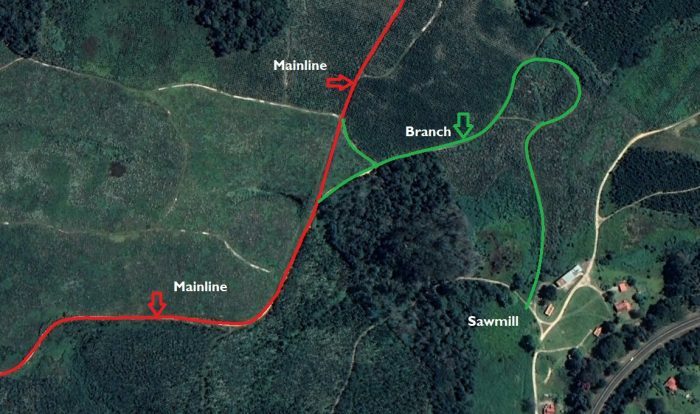 http://timberroute.co.za/wp-content/uploads/2014/05/Timber-Map-web.pdf, accessed on 23rd March 2019.
http://knysnawoodworkers.co.za/articles/knysnas-coffee-pot, accessed on 23rd March 2019.
https://www.knysnamuseums.co.za/pages/the-coffee-pot-railway, accessed on 23rd March 2019.
https://en.m.wikipedia.org/wiki/South_Western_Railway_(South_Africa), accessed on 23rd March 2019.
http://www.webring.org/l/rd?ring=ngmodrly;id=64;url=http%3A%2F%2Fwww%2Eherman%2Erula%2Eco%2Eza%2F, accessed on 23rd March 2019.
https://en.wikipedia.org/wiki/Stinkwood, accessed on 24th March 2019.
http://knysnawoodworkers.co.za/articles/characteristics-of-our-indigenous-trees/stinkwood-ocotea-bullata, accessed 24th March 2019.
https://www.rarewoods.co.za/yellowwood, accessed on 24th March 2019.
https://www.parkesofknysna.com/knysnawoods/index.html, accessed on 24th March 2019.
http://www.woodmans.co.za/timber/yellowwood.html, accessed on 24th March 2019.
https://sahris.sahra.org.za/sites/default/files/heritagereports/9-2-052-0040-19980201-ACO_0.pdf, accessed on 24th March 2019. Margaret Parkes & V.M. Williams; Knysna, the forgotten port: The maritime story; EMU Publishers,1988, 2004.
http://www.historycape.co.za/files/7714/3783/3895/RHG_Bulletin_no_129_part_2.pdf, accessed on 24th March 2019. Sidney Moir; 24 Inches Apart; Janus Publishing. Second Edition Revised. 1981, (originally published in 1961). 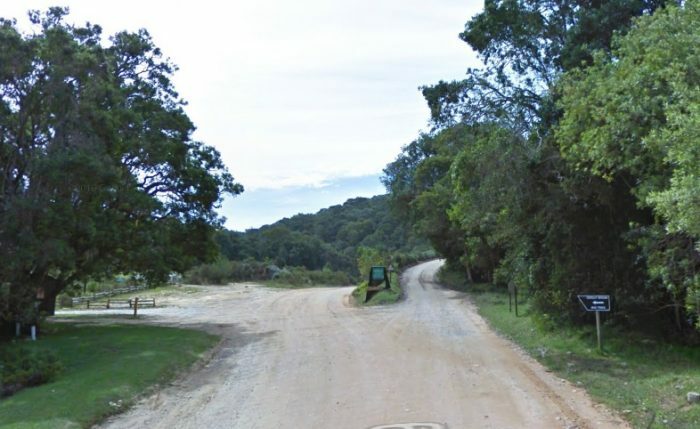 http://www.historycape.co.za/images-places, accessed on 24th March 2019.
http://www.thesenislands.co.za/about/history.html, acccessed on 24th March 2019.
http://www.sollygutmanscratchboardart.com/knysna.html, accessed on 25th March 2019.
https://www.outeniquachootjoe.com/blog/post/opening-of-the-george-knysna-railway-line-1928, accessed on 25th March 2019.
http://www.northstarrailway.com/wp-content/uploads/2016/09/THE-NORTH-STAR-CHRONICLES-Vol-3-no-9.pdf, accessed on 25th March 2019.
https://www.knysnamuseums.co.za, accessed on 25th March 2019.
http://knysnawoodworkers.co.za/articles/knysnas-coffee-pot, accessed on 3rd April 2019.
https://www.revolvy.com/page/South-Western-Railway-(South-Africa), accessed on 3rd April 2019.
https://www.slideshare.net/capecoastalroute/1-rooted-in-time-templeman-station-knysnas-coffee-pot-railway, accessed on 3rd April 2019.
https://www.knysnamuseums.co.za/pages/the-timber-merchants, accessed on 4th April 2019.
https://www.slideshare.net/capecoastalroute/4-rooted-in-time-diepwalle-forest-station-houses-famous-foresters, accessed on 15th April 2019.
https://www.pinterest.co.uk/robinthesensmit/old-knysna-photos, accessed on 15th April 2019. 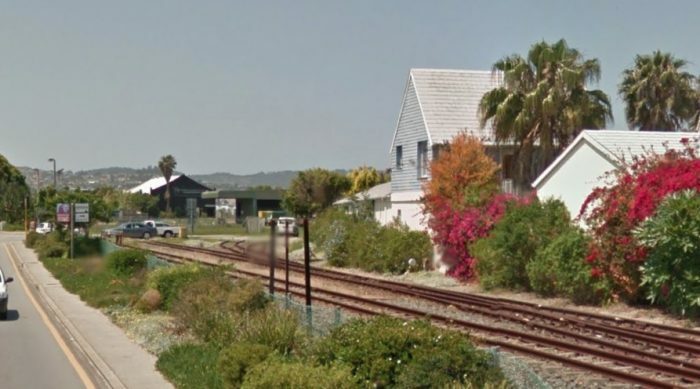 This entry was posted in Railways Blog, South Africa on April 15, 2019 by rogerfarnworth.